For sure, that’s a tough pill for fan girls and boys to swallow. There are legions of stubborn partisan Democrats who want the law to work—an admirable goal, given the realities of the uninsured landscape. We get that. But in casually adopting or accepting one of the more derisive political-messaging terms in recent memory, faithful surrogates (including the namesake himself) are refusing to put it to rest. In that sense, it’s worth wondering whether supporters are actually interested in making certain the Affordable Care Act actually does what it says or if they’re more interested in preserving its creator’s political legacy. These are two vastly different goals—the latter as politically impolitic as the incessant Republican effort to repeal it. Hence, the brand finds itself stuck in a ditch of bad association. It’s probably too late to turn back from it, the name forever burned into the national consciousness—from its bad website to a string of bad news about millions suddenly losing policies when President Obama said they wouldn’t. And we can attempt to extrapolate morsels of spin from any crumb of polling data suggesting the public actually loves the law (they just don’t know it yet, right? ), but the fact is that the nation is still either divided or undecided. When Real Clear Politics averages all the latest polling data on the health care reform law’s rollout, 51 percent of Americans are against it and 42 percent are not. Which means the country is still very split as the health law percolates into regulatory ubiquity. This really isn’t an argument against it, merely an observation on a topic that—three years later and counting—is continuing to stir ideological emotions well into the 2014 election cycle. We can certainly blame the GOP for that, but overusing a derogatory brand name the Republicans created can’t help the cause. 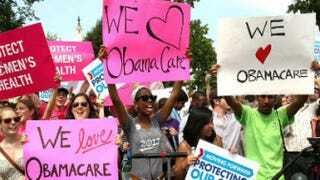 How annoying it is to find the law’s faithful using “Obamacare” as much as the demagogues who coined it. Just as irritating is the media’s use of the term in headlines and cable news tickers. That’s not the real name of the law, merely a nasty conservative interpretation of it. Yet in the spirit of keeping journalism unbiased and balanced (not), editors and producers have also adopted widespread use of “Obamacare” as if it were written on the actual bill. Fact-check that. Making it harder is when the president, for whatever reason, also uses it as if he trademarked it. Is it ego? Ask him. But as his landmark policy’s rollout sputters on start, he might be wise to engage in a messaging refresh rather than stay the course with crusty themes. There’s still a good chunk of the country that can’t stand him. So why assume they’ll like a law with his name branded on it? Granted, it’s the same bloc of voting hillbillies from districts as red as a Santa Claus suit, and granted they didn’t vote for him in the first place. But this debate is unnecessarily noisy—and costly, too: more than $26 billion and some jobs, we last heard in the shutdown postmortem analysis. The least the president could do is put out some edict or an internal party memo or something: “Stop using my name to describe the Affordable Care Act because it only pisses people off.” Win hearts and minds one low hanging fruit at a time. Politics is a messaging and optics game. On the subject of an overhaul for a flawed health care system, the law should never have been about him. It should be about providing affordable and accessible health care to Americans. Period. The polling on “Obamacare” speaks for itself. On the eve of the ACA rollout, a CNBC poll discovered that “30 percent of the public [didn’t] know what ACA [was] versus only 12 percent [for] Obamacare.” Compounding that was the 46 percent who opposed Obamacare, versus the 37 percent who opposed the ACA. Weeks later, most pollsters stopped using “Obamacare” in their questions, perhaps wising up to the fact that respondents didn’t really know what they were being asked. But according to a YouGov poll, that hasn’t stopped public anger over the law and a finding that 42 percent want it repealed—even though 79 percent admit they’ve never visited Healthcare.gov. Maybe we can argue that a rocky rollout eventually helps force greater public awareness and understanding about a confusing law. Or maybe the White House could seriously push a principled discussion rather than a partisan conversation that merely results in locked horns with the opposition over who said what first and why they’re wrong. And are you going to stick by the name because you think it’s a snarky retort to the opposition, or are you going to get on with the business of providing people with needed services? So what’s the problem? “Affordable Care Act” is only two syllables longer than the four-syllable Obamacare, and all you have to do is keep hashtagging #ACA—so you can’t make a plea for brevity. Any uninsured person with a little desperate sense would be more inclined to go with the Care that is Affordable rather than the care taken over as some special rhetorical shrine to a politician. Wouldn’t you? Charles D. Ellison is a veteran political strategist, Washington correspondent for the Philadelphia Tribune and chief political correspondent for Uptown magazine. When he's not mad, he can be reached via Twitter.